Pull out your old jersey and wear your vintage clothes to the FCRCC PNWORCA race! There will be a 5 kilometer short course and a 12 kilometer long course. All craft will start at the same time for both the short and the long course but OC1s and V1s will have a slightly different start line. 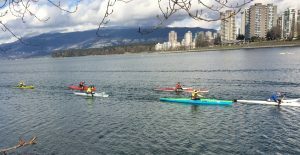 The short course starts on the North side of the mouth of False Creek, heads to the green can, left turn around green can, then to barge can, left turn around barge can, head towards red can, left turn around red can, and finishes at the Burrard compound dock. The long course is the same as the short course, but after the red can, you head to a yellow bouy that was the start line, head towards yellow QC mark off of Stanley Park, (in line with the green can) and back with a left turn around the red can, and finish at the Burrard Dock.